Lewis Banks spent 12 years at the Potters, but joins the Bit O’Red ahead of next week’s league opener. Banks in the Sligo shirt. 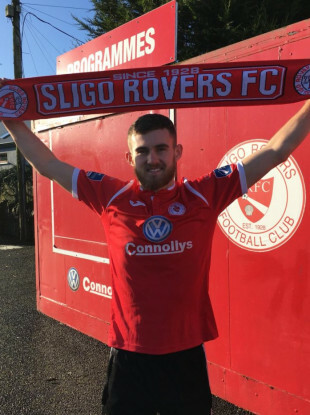 SLIGO ROVERS HAVE announced the signing of Lewis Banks. The 21-year-old defender came through Stoke City’s youth ranks and captained their U23 side — making 59 appearances in the Premier League’s reserve league. He joined semi-professional outfit Stafford Rangers back in August, but was eager to return to full-time football in the SSE Airtricity League. Banks arrives at the Bit O’Red ahead of their opening Premier Division fixture of the season away to champions Dundalk on Friday, 15 February. He is a right full-back by trade, but can also operate across the backline and in midfield. “I jumped at the chance when I heard of Sligo’s interest,” Banks said. “I think it’s a great opportunity for me because full-time football is something I’ve been keen to get back to. “I had 12 years at Stoke – which I really enjoyed of course – before moving on. Stafford Rangers are a really good club – but I can’t turn down that chance to be back in the environment where your entire day and life is about football. You miss going in every morning and things like that and I think Sligo Rovers is a place for me to shine. I want to play firstly. It’s a big move to go to Ireland but it’s a great one for me to show what I can do. My agent told me of the interest and I said ‘yes’ straight away to be honest. There was a week or so to be able to get here today. Now what I’m here I really like the set-up and the research I did shows this to be a really good club. Sligo manager Liam Buckley added: “Lewis was the U23 Player of the Season at the end of 2017 with Stoke. He was captain there as well and I’m delighted to have him here with us. “We’ll be looking for him to make an impact and I think he has the quality to do that. “He has plenty of ability and that versatility is brilliant for us. He can also play in midfield as well as the back four. Email “Sligo sign former Stoke City defender”. Feedback on “Sligo sign former Stoke City defender”.